Here is a very tiny breakout board for the Atmel ATtiny10. It's so small, you'll lose it. Literally. I lost one in the carpet and I'm hoping to find it before the vacuum does. 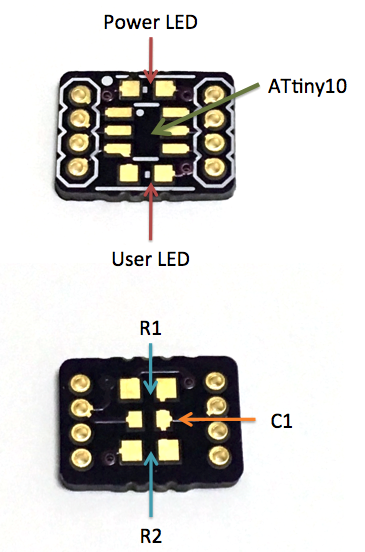 ATtiny10 Mini Breakout Board next to a 5mm LED. This breakout board is for the ATtiny10 microcontroller. 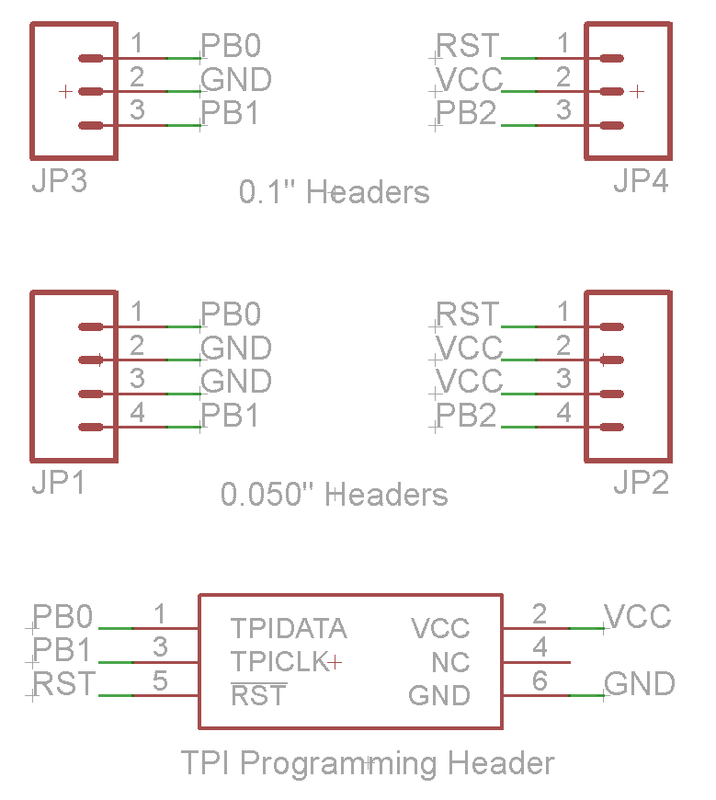 The PCB is 0.25x0.325" and uses 0.050" header pins. The board could actually be made smaller, but I ran into the minimum PCB size limit on OSHPark. Despite the tiny size, I was able to include a 100nF bypass capacitor, power LED, and a user LED on pin PB1. That pin is also the clock pin for the programming interface, so it flashes when the board is being programmed. 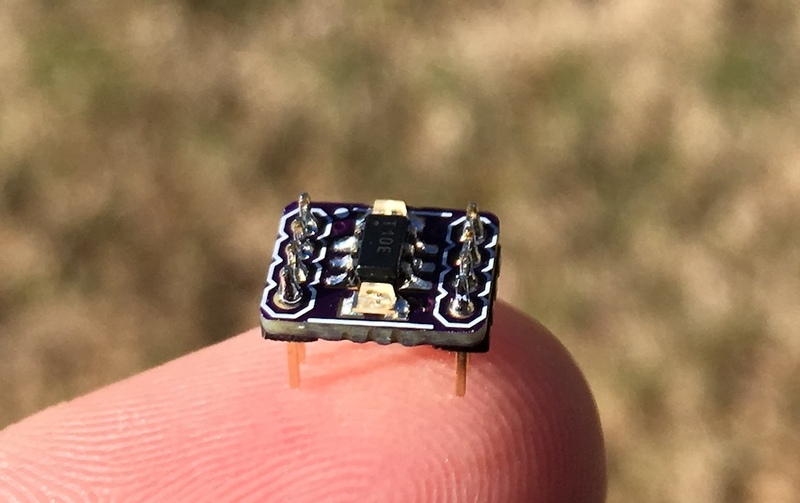 This breakout board might be confused for a bug. The board is so tiny, it's difficult to use and program. It is certainly not breadboard compatible due to the small-pitch headers. To alleviate these problems, I created a small landing pad board for it. This adapts the 0.050" headers to 0.1" headers. 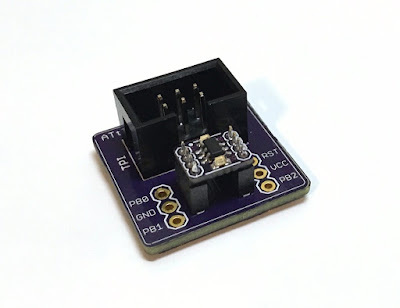 Additionally, the landing pad has a 6-pin TPI programming connector. 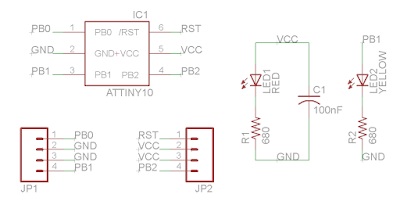 This allows the ATtiny10 to be programmed with an Atmel ICE. 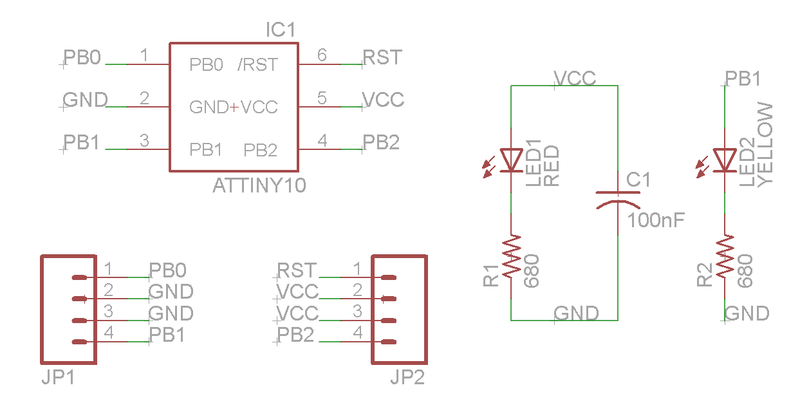 You can also program ATtiny10s with an Arduino and a little extra circuitry. program, and use the ATtiny10 mini breakout. Show it off to your friends and demonstrate your fine soldering skills! 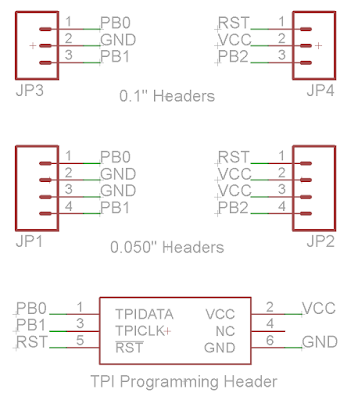 Incorporate it into a project's PCB by adding 0.050" male headers on your board. 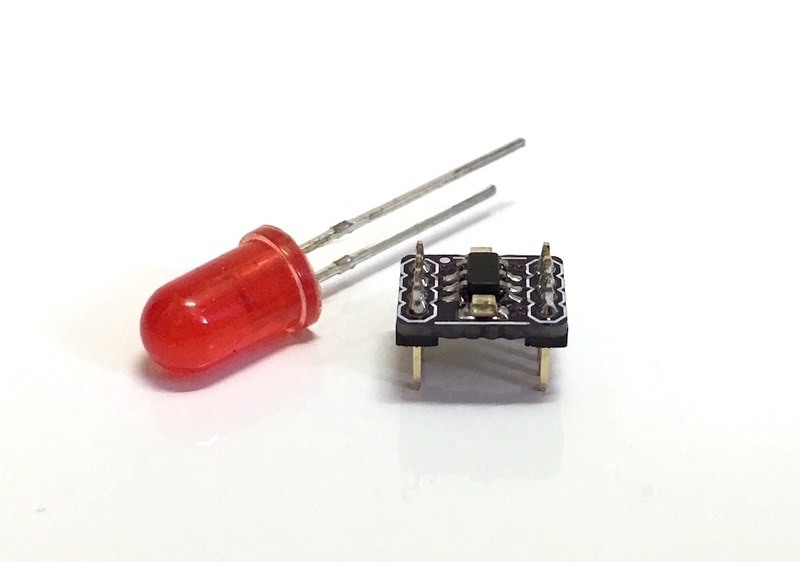 The ATtiny10 may be tiny, but it has 1k of flash, 4 GPIO, a 16-bit counter, PWM, an ADC, and capacitive touch sensing. but the microcontroller itself is fully functional. 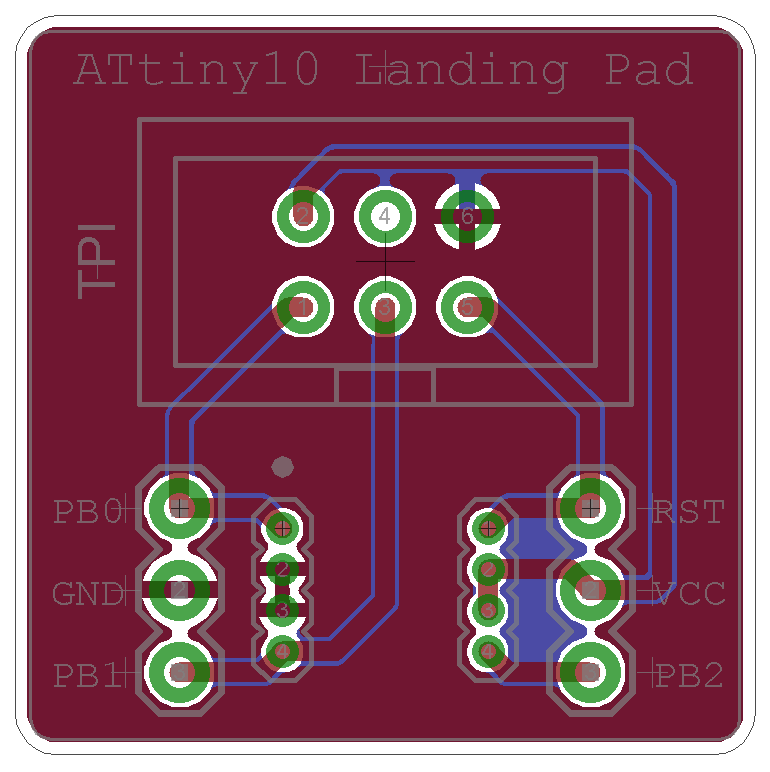 Here's the information you need if you'd like to assemble your own pint-sized ATtiny10 breakouts. 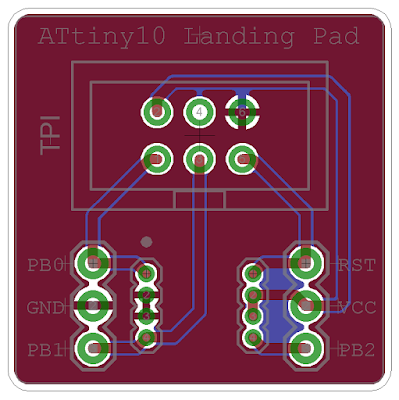 ATtiny10 Mini Breakout Landing Pad: Order PCBs on OSHPark! silk screen, so here's a picture showing where the parts go. If you assemble your own ATtiny10 Mini Breakouts, let me know! This board is kind of a novelty, but it's fun to play with a fully functional AVR breakout that is so small. Nice and I may consider using it. Great, let me know if you make some! Wow! How did you squeeze a bootloader and code into 1KB of flash? Hi, there is no bootloader. I program using Atmel Studio (sometimes in assembly if things are really tight) and then upload with an Atmel ICE. 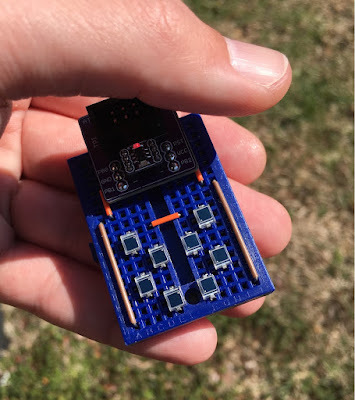 So I am curious about your logic here, since you seem to have built this tiny little breakout board with 0.05" headers, and then immediately created a breakout board for your breakout board so you can flash it and put it into breadboards. Since likely any custom board would end up being made overall larger by having the headers to accomodate this breakout than by soldering the components direct and adding pads for pogo flashing, I have to ask: What is the end goal here? I'll make some, if i remember well there is a way to upload hex code on attiny10 with arduino, search for it on google. Thanks! I agree with Phil Tooley . whats the point. it's certainly not hobbies friendly. unless you want to and solder lead wires directly. 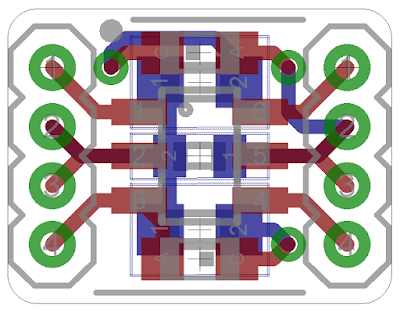 It would be breadboard friendly if made to fit the footprint of a 555 chip for instance, still "cute" enough for most of us. It was the challenge of making it that spurred him on I assume. Otherwise, just use a regular ATtiny chip that is breadboard friendly and only twice as big. I must admit that "pushing the limits" is what leads to innovation and change so kudos on your design even if it has limitations, someday it might not. Some people seem to overlook the fact that putting it on a breadboard is the only use for it. Just think of all the items it will fit into and function as the "brain" to make them work. Wow. I too would like to see the Eagle files uploaded. 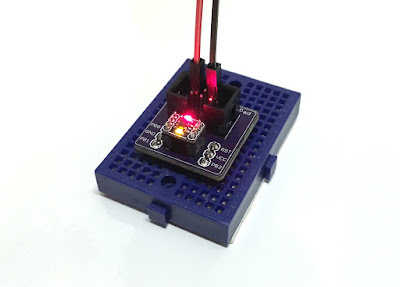 Blog Hits 10k Views + "Quick PCBs"